When something goes wrong with your door, you want to get it fixed quickly. Many homeowners find that it’s almost impossible to go about their daily business without a garage door that's working correctly, so it’s often essential to arrange for repairs immediately. We offer a quick response time and a fast repair service that leaves customers 100% satisfied. Our technicians work quickly to fix or replace any parts that might be damaged, putting your door back in working order in no time. Garage doors are the largest pieces of machinery in most homes, and they work hard day after day to ensure you can easily and safely get in and out of your property. They’re built to last, but inevitably they do end up developing issues over time. We understand the problems that homeowners can face when their door breaks, and we understand how best to resolve them in a timely fashion, whether it's an opener malfunction, a bent track or simply rusty hinges. When a garage door stops working correctly it’s not always clear exactly which component is at fault. Failure of one component can have a knock-on impact on others, and without an expert eye it’s easy to overlook more subtle damage. When a spring breaks, for example, the shock from the sudden release of tension can cause the door panels to tilt, and even collapse. The safety cables can also suffer from the unexpected jolt, and can get damaged as well. Our engineers are experienced at diagnosing the underlying problems with your garage door, not just the obvious ones, and we can repair or replace every single one of its many components. We offer our customers a fast, reliable service that gets the job done to a high standard. If you’re in need of repair services, make sure you contact our experts at Garage Door Repair Snellville as soon as possible, and we’ll be happy to solve your problem. 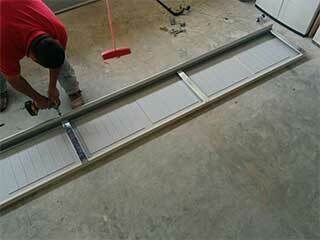 For fast, reliable, garage door service at its best, think first of our professional team. Whether you need maintenance, repairs, or a new door, our experts are the ones to call. Check out our services today and see why we have the highest rating in town for garage door customer satisfaction. Thank you for choosing our company! Feel free to browse our website for more information in the meantime. Our team at Garage Door Repair Snellville is at your service any time!